Colombia has been using RoundUp in aerial fumigations to strip the leaves off of illegal fields of coca plants, from which cocaine is manufactured. Countries across Latin America have been using the chemical as part of US-sponsored anti-narcotics programs for nearly two decades. 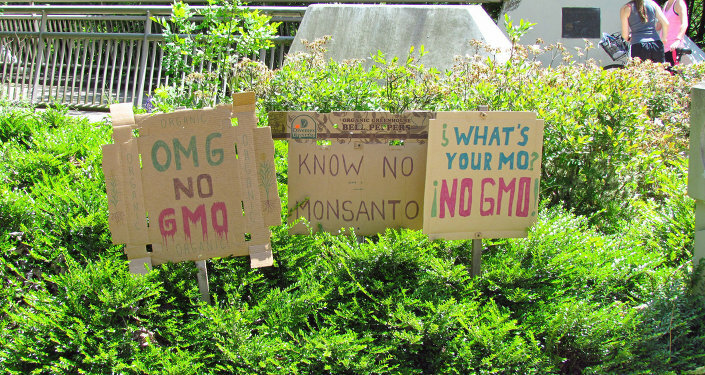 The chemical was recently declared to be "probably carcinogenic" by the World Health Organization (WHO), though Monsanto has vocally criticized the classification and demanded it be retracted. "I am going to ask the government officials in the National Drug Council at their next meeting to suspend glyphosate spraying of illicit cultivations," said Colombian President Juan Manuel Santos. "The recommendations and studies reviewed by the Ministry of Health show clearly that yes, this risk exists," referring to the the WHO report. 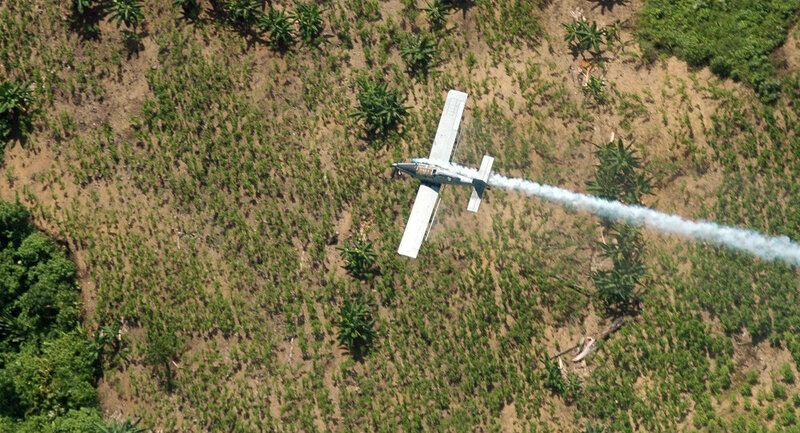 Aerial fumigations have been used to destroy crops which are usually located within territory held by the Rebels of the Revolutionary Armed Forces of Colombia (FARC) which has been engaged in an insurgency since 1964. An estimated 220,000 people have died in the conflict since it began. Authorities say FARC uses the money from the illicit drug trade to fund their insurgency. The drug eradication program in Colombia began in 1994. Aerial fumigation has been criticized for being less effective than manually going through and eradicating plants, and for the possible damage it can do to neighboring, legal crops as well, such as coffee. Between 2001 and 2013, the amount of land under coca cultivation in Colombia has decreased from 345,000 acres to about 118,000 acres. According to Food & Water Watch which, along with the Washington Office on Latin America (WOLA), called for just such a ban on aerial RoundUp fumigations earlier this month, Colombia and the US together have spent an estimated $100 million purchasing the chemical from Monsanto for the destruction of coca since 2003. 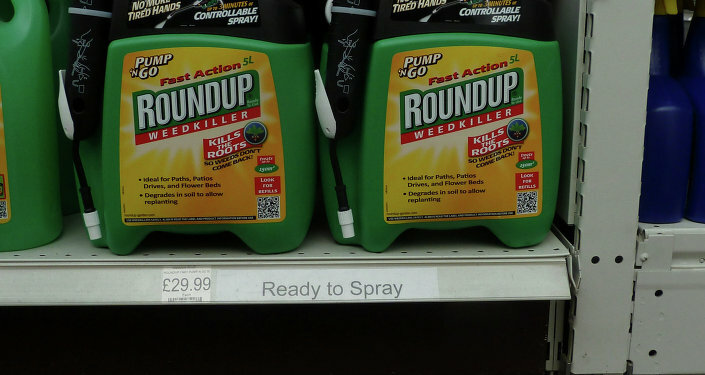 "It is bad enough that the US government enriched Monsanto with tens of millions of taxpayer dollars," Darcey O’Callaghan, international policy director at Food & Water Watch said in a statement. "When you consider that this money went toward aerial spraying of a probable carcinogen in populated areas, such corporate subsidies are unconscionable." Adam Isacson, senior associate for regional security policy at WOLA, said the best way to battle coca is with development, not aerial fumigations. "Instead of spraying it from above, Colombia must govern its territory on the ground, with state representatives present to oversee the crop’s manual eradication and to integrate farmers into the legal economy through development assistance." Colombia — where an estimated 4.34 million acres have been sprayed with RoundUp — is the first Latin American country to make this type of declaration regarding Monsanto's most (in)famous product, though there have been mounting pressures in the region to ban the chemical, as it is in many European countries. A group of 30,000 medical professionals in Argentina, for example, recently called for a ban on the chemical following the WHO report. The Physicians Network of Sprayed Peoples (RMPF) said that each year in Argentina, 108,000 square miles of soil is sprayed with more than 320 million liters of glyphosate, putting 13 million people at risk of being affected.